Louise's has been providing Birmingham and surrounding areas with beautiful, custom, freshly baked, wedding cakes for over 35 years. Schedule an appointment to come in and discuss your special day! Our wedding consultations are generally scheduled on Tuesday through Friday and typically last about an hour. Please bring anything you would like us to use as inspiration for your cake. This could include pictures of cakes, wedding decor, color swatches, pictures of your dress, etc. We can create a custom design based on your wedding theme, you can pick a design from our book, or we can combine elements of multiple cakes into one to create your dream cake. During the consultation we will provide you our standard wedding cake flavors to sample (traditional white wedding cake and chocolate groom's cake). If there is another flavor you would like to sample, please let us know in advance and we will be happy to have that for you to taste as well. Our wedding cakes start at $3.25 per serving for buttercream and $4.25 per serving for fondant. Final price is dependent on the flavor, number of servings and complexity of design. We will be happy to provide you a quote for your specific cake during a wedding consultation. If you aren't able to come in for an appointment, we can also provide you a quote through email after we get all the relevant details. We are a full service bakery and are constantly adding new recipes, so this is just a list of common flavors used in wedding cakes. Don't hesitate to ask if you have a flavor in mind that is not listed here! 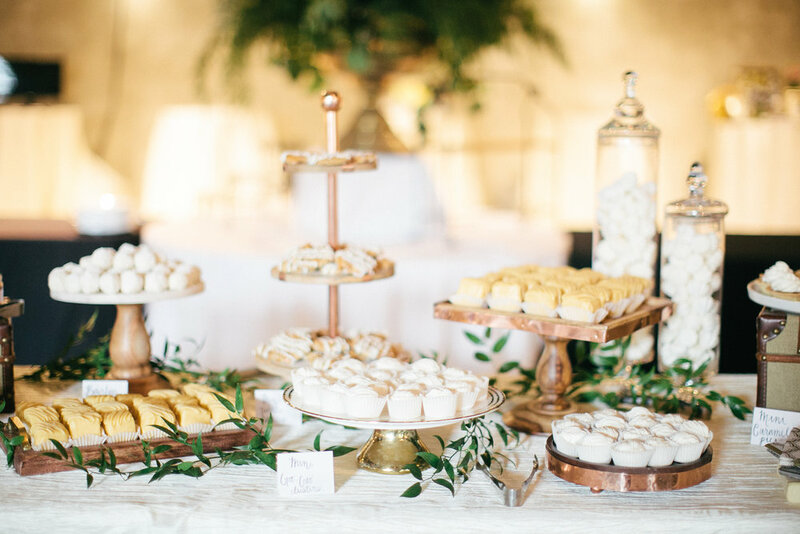 Ask us about our dessert bar options!